The National Law Journal has a story discussing the disparity between associate and partner pay in large law firms. See Leigh Jones, Pay: It's All Relative. Until the recent starting salary bump to $160,000 per year, new associates were making 11.7% of the amount partners pulled in for 2005. According to the story, this is the smallest percentage in the last 10 years. Last week, the NLJ reporter called me up to ask for possible explanations for this pattern. My initial reaction was changes in large law firm leverage. Profits per partner are determined by dividing total firm profits by the number of equity partners. Perhaps large law firms are relying more heavily on associates, staff attorneys, of counsel, and nonequity partners, thus spreading profits over a smaller pool of rainmaking partners. The data largely corroborated my theory, but I was quite surprised by the magnitude of the trends. The table below provides a quick snapshot. Methodological notes: My sample is limited to firms listed on the NLJ 250 in 1995 and 2005. The NLJ 250 is defined as the 250 largest firms based on the number of lawyers. This list substantially overlaps the Am Law 200, which is the 200 largest firms based on revenues. I generated the change variables only from firms who provided the necessary data for both 1995 and 2005. Between 1995 and 2005, the number of firms willing to provide a breakdown between equity and nonequity partners fell from 192 to 168. So some of the change figures above are limited to 168 firms. This reticence in reporting partner breakdowns is a telling development, but first the major trend (after the jump). In a nutshell, precious few lawyers are making it to the equity tier. While the total number of large firm lawyers increased by 77.2%, the number of equity partners increased only 31.7%. 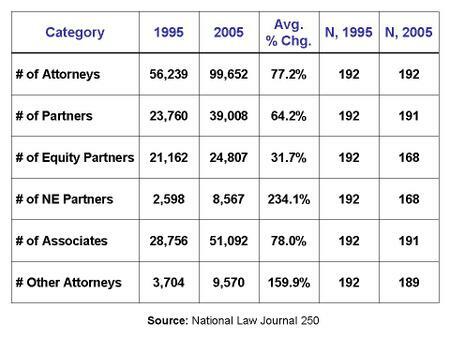 The number of associates increased roughly in proportion to the number of total lawyers. What ballooned, however, was the number of nonequity partners (234.1%) and other lawyers (159.9%). This latter category includes permanent associates and Of Counsel, which can be functionally the same as nonequity partners--i.e., their salaries are fixed by contract and thus increase leverage for equity partners. So if the chances of reaching the brass ring--equity partner--become smaller, how does the tournament maintain a critical mass of entrants? (1) it raises entry pay to $160K, (2) it offers more consolation prizes (permanent nonequity and Of Counsel positions). In years past, becoming partner was a function of excellent work and long hours; the hard part was getting your foot in the door. Now, equity ranks are increasingly reserved solely for lawyers who control large books of business. The refusal to publicly divulge the number of equity and nonequity partners may be explained my a desire of firm leadership to manage both internal and external perceptions. Perhaps it would be bad for morale if partners knew where the firm drew the line between equity and nonequity. Outside the firm, the higher reported PPP, even if done through accounting tricks, can burnish the firm's relative prestige in the market for clients, lawyers, and merger candidates. Unfortunately, this suggests that self-reported data supplied by firms may become increasingly less useful and reliable. But perhaps the major implication of the new large law firm model is that the next generation of corporate lawyers--by far the fastest growing segment--are largely going to begin and end their careers as employees. I wonder what the implications of this trend are for the future of lawyer self-regulation? The high-leverage model of big accounting firms (~25:1) may provide some clues, but accountants engaged in public audits are not attempting to advance their clients' self-interest. And when public accounting and consulting were co-mingled in a single relationship partner who had strong incentives to cross-sell services (i.e., David Duncan and eat-what-you-kill), effective self-regulation largely broke down. SOX ultimately rewrote the rules for accountants. It is too early to say what will happen with the legal profession, but I think the winds of change are blowing much harder and faster than we previously realized. Bill, I think this is correct. The tournament model almost belongs to another era. The changes you are analyzing are occurring in the UK also. A couple of things arise here. One, associates don't even consider becoming partners or an ever-diminishing number do. This may be because they see it as too remote or because frankly it isn't worth the battle. Partners like associates are essentially fungible unless you possess some key rainmaking skills. Two, there are plenty of alternative careers for lawyers now, which no longer carry the stigma of failure. Banking is increasingly attractive, either as inhouse counsel or as a banker. Consider Harvey Miller's move from Weil Gotshal to Greenhill. Annual attrition rates are now approaching 30% for associates. It's probably too late for law firms to do anything to counter the trend. I don't think Allen & Overy's putting an associate on the management board will suffice, nor will all the other arrangements you mention. Finally, when the Clementi changes go through and law firms are owned by external investors, eg, Goldman Sachs, KKR, etc, partnership will die a lingering death as they chase the IPO.